The SR552 Voltage Preamplifier is designed to work with SRS lock-in amplifiers, providing gain where it is needed most—right at the experiment. The preamplifier minimizes noise and pickup in the connecting lines and can reduce measurement time in noise-limited experiments. The SR552 differs from the SR550 in its bipolar front-end design. The SR552 has a lower input noise and a correspondingly lower input impedance (100 kW vs. 100 MW) than the SR550. When used with the SR510 or SR530, the preamplifier gain is automatically set by the lock-in. When used with the SR850, SR810 or SR830, the gain is always set to 100. Power and control signals are brought from the lock-in by a 9-pin cable (included). 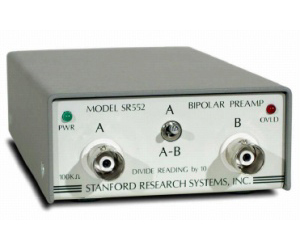 The SR552 may also be operated independently by applying appropriate power supply voltages (±20 VDC, +5 VDC).